I could never get the complete page to load, but the booking matrix has been changed to display roundtrip prices rather than splitting them up as outbound/return fares. The site wasn’t really working, so I can’t say that I don’t like it, but I will say this: I can’t figure out how to sort results by departure time, fare, or any other criteria. Maybe I’m overlooking it, but if sorting is gone, I’m not going to be happy. Again, the site wasn’t working properly so I’m withholding judgement, but I did notice a few other important features/functions that (for now) seem to be missing. If it turns out that they’re gone for good, then this is definitely not a “upgrade”. I was able to book one ticket and other than the pricing matrix the rest of the process seemed unchanged. Thankfully, the 24 hour hold is still there (always a worry to me anytime they make a change, not because of any rumors, but just because I’m paranoid). Here’s a link to a info page, complete with a video, describing how it’s supposed to work. Have you had a chance to try it yet? Your thoughts? Why are you with holding your judgement? If the page isnt working properly, that seems like enough reason to comment that its broken. Lots of folks have reported page display issues. Hitting the browser refresh (f5) should clear it up. I do not like it. You no longer can display all the classes in one row, or all 4 pages of flight optiones on one page. Just adds more clicks and frustration. @ victor @ Swag – Thanks for the updates. I was able to give a try. @ Mike L. – I was hoping that the missing features would return when I was able to get the site to work. I was wrong: the site is working and it’s still a mess. @ HIS – I agree with you. Not having the fares displayed on a single page is super annoying. I don’t have a problem so much with the way prices are displayed, and I think the “Choice Essential” packages are a great idea, but they’ve completely munged the interface. And did I mention that you can’t sort fares? Aaugh! Still the old look for me. Well if you can’t sort by the way you want to look for flights then what’s the point. Very bad. Very bad indeed. 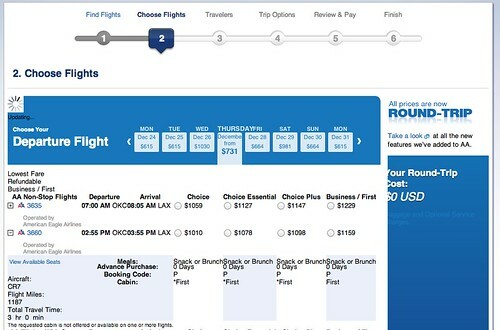 Confusing compared to the old web page, which was far better than any other airline’s. This must have been designed by the same team that did the Apple Maps app for the IPhone 5. And I am not sure it is working properly either. 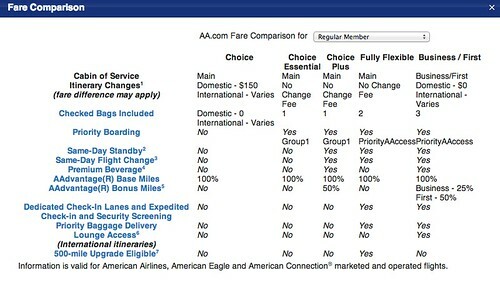 I priced a flight yesterday where the cheapest “Choice” coach seat was twice the price of a business/first class seat.